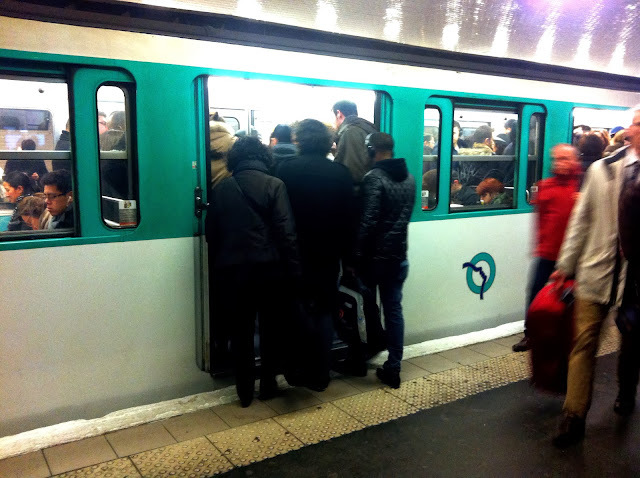 My Love for Paris: You know you're on a Parisian metro when..
1. You forget that other colours actually exist in the colour spectrum besides varying shades of black, black and black. Or maybe on a wild day, a dash of grey. 2. You are standing so close to your fellow commuter that you can feel their breath, and it feels strangely ... intimate/creepy depending on how attractive you find them. 3. You have 3G! Yay! Or E! Having an underground transport system that still gives you internet access now and then is great (especially when you are stuck and need to tell someone you are not standing them up). c) someone with just a, natural scent. You can also distinguish the respective different combinations and permutations between the three, with or without cologne. 5. Your ears prick up and you put your book/newspaper/mobile phone to the side when you recognise someone speaking in English. You then continue to discreetly eavesdrop into their entire conversation, sometimes resulting in you missing your stop. Damnit. 6. You wince when the last minute commuter decides to take a risk and jump onto the carriage after the warning bell has sounded and then proceeds to get stuck in the closing doors and has to be pried away in order for the train to start moving again. 7. However, you feel like, REALLY good about yourself when you take that exact same risk and make it in time to jump on the carriage at the very last minute after the warning bell has sounded! YEAH! (Unless you didn't make it and had to be embarrassingly pried away from the jammed doors by a fellow commuter). 8. You know what's going to happen when a man carrying an accordion gets onto the carriage. Yay! Old French accordion music time! You then question if that busker was actually French after hearing their accent when they come around asking for tips. 9. You also know what's going to happen when a person gets onto the carriage and apologises for disturbing your journey, presenting their story and how they arrived at their situation before asking for a little "piece". They finish with a gracious thank you for all your time ladies and gentlemen, wishing you a good journey home, a good day and a good continuation. You feel that they might want to consider shortening their discours as half of the carriage has already gotten off mid way through their elaborate speech. 10. You aren't phased when you see someone on the metro with a dog. Or a cat. Or even a grown man, carrying a cat, in his arms. On the metro. 11. You think about what it would be like to drive home (in your imaginary car) instead of having to catch the metro, but then you do a double take when you see the ridiculously gridlocked traffic jam through the windows of the metro and quickly change your mind. 12. You look at that pole in the middle of the carriage that everyone puts their hands on to hold onto and wonder how moist and sweaty and gross it is. You then close you eyes when all the seats and 'leaning against something' positions on the metro are taken and you too end up having no choice but to hold on to that very communal pole. 13. Unless, it's peak hour. You realise that you don't need to hold onto that communal pole because you are packed into the carriage like a sardine and someone's backpack has locked you into place. You physically cannot lose your balance and fall over because, there is literally no room to fall over. 14. You start to recognise which busker/beggar/gypsy/homeless person lives/works at which part of each metro station. You then become slightly worried when they aren't in their usual spot one day. 15. You notice that not very many women wear ballet flats/thongs/comfortable shoes with their work clothes on the metro in order to change into heels when they approach work. You feel weird when you do it yourself but justify it with, well in London they do this! You then quickly change your mind and never do it again. (You also notice that in addition to not changing their footwear, hardly anyone seems to eat or apply their make up on the metro). b) you know that sooner or later you're going to have to give up your seat for someone else and stand up again. 17. You feel like a lab mouse rushing around the passages of the metro station and swear that someone up there has aligned the signs in a roundabout way on purpose so that they can look down and watch you take inefficient windy back tracking paths that take twice as long to get to your desired platform. 18. You then arrive at your station after 1 minute and realise it would have been quicker to just walk those 500 metres from where you started in the first place, instead of following all those signs like a lab mouse to get to your platform (I'm talking to you Châtelet Les Halles). 19. You might miss out on an announcement over the loudspeaker but can guess fairly accurately that you aren't going anywhere for a while as soon as your fellow commuters start sighing loudly and swearing in French. Hey, there is also another point: the metro is often or always delayed and you know that's pretty normal! You don't need to really guess the reasons because there are contained into those three ones: traveller sickness due to crowded place, pranker that has ring the alarm, someone is blocking the doors! True true!! 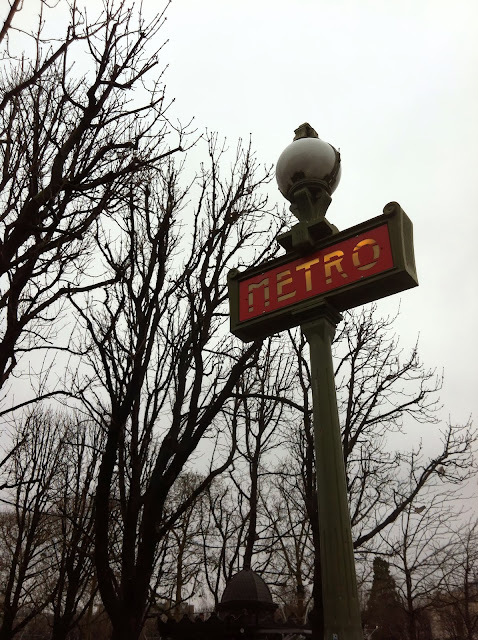 You're definitely a well metro-ed Parisian ;) and seriously WHY would you ring that alarm as a joke, why, WHY! I've never actually seen it but I could imagine the death stares you would receive.